Nvidia is moving into the smart home with the announcement of the Nvidia Spot, a tiny connected device that will bring ambient AI to your house. Rather than building its own assistant, Nvidia is instead drawing on Google Assistant and its own Shield TV device to bring the smart home together. The Spot, announced at CES 2017, is a small microphone that will extent the reach of Google's AI around your home. The brains of Google Assistant and Samsung SmartThings will sit in the new Nvidia Shield TV, while the microphone nodes will live around the house. Here's everything we know about Nvidia Spot right now. The Spot, as its name suggests, is tiny. 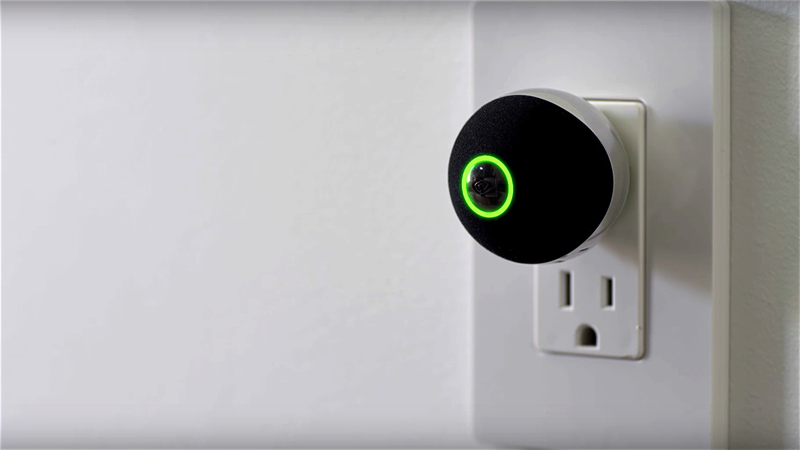 It's really just a small microphone, about the size of a golf ball, that can be plugged into any wall socket. Aside from the green ring that lights up when it's on, it's rather unassuming. However, don't be fooled by the size - that mic is pretty smart. Its far-field processing and echo cancellation mean it can pick up relatively natural speech from up to 20 feet away, says Nvidia. We're yet to test it out, but it means you should have no problem getting Google to hear you, and you'll likely only need one per room (mansion dwellers, this rule may not apply). The brains, meanwhile, live in the Shield TV, Nvidia's entertainment streaming device. This is where all the computing is done, and unfortunately the Spot isn't going to be compatible with other smart home devices like Google Home, so you are going to need an Nvidia Shield if you also want to use Spot. Nvidia Spot: What can it do? What's special about the Nvidia Shield as a smart home device is that it also packs in Samsung's SmartThings alongside Google Assistant. By their powers combined, Nvidia has a way to bring your smart home together, by giving Google's AI a means of speaking to other IoT devices. In a demo we tried, an Nvidia rep simply said, "Ok Google, start my day", to which the Shield turned on the thermostat, brought up the lights, and started brewing us a fresh cup of coffee. It was an impressive example of how Spot will extend AI into the rest of your home. To have SmartThings connectivity on the Shield, you'll need to purchase a separate dongle that plugs into the Shield. While that's an added thing to buy, it definitely seems like it will be worth it. Nvidia told us that old Shield units will get an update to make them compatible with Spot, so don't worry if you hadn't otherwise planned to upgrade to the newer model. We also asked Nvidia if Spot would work with Google Home, negating the need to buy a Shield, but due to the SmartThings integration you'll need to have the Shield TV box for Spot to work. The Spot is going to cost $50, which isn't cheap for what is essentially a microphone. However, it is significantly cheaper than buying multiple Google Home hubs for the house. In fact, Nvidia's solution would mean you could run Assistant through the house without a Google Home at all, so long as you have a Shield. That will set you back $200. While we're talking competition, Amazon offers the Echo Dot for the same price as the Spot, and each one functions as a base station. However, we'll be putting the two head to head when we get our hands on a Spot to see just how well they compare. Nvidia hasn't yet announced a launch date for Spot, but said it will be soon. With the new Shield shipping later this month, it can't be far behind.